Jamel Holley: I have never been as disappointed as I was yesterday. 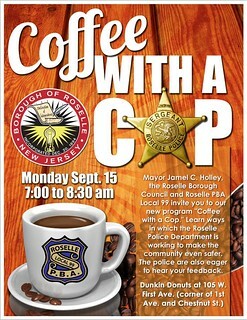 One early Monday in September, Roselle Mayor Jamel Holley’s going to try out something new. I think it has promise. He’s going to hang out at the local donut shop, with some local police officers, just to make themselves available for a chat with residents, hear what’s on their minds or what’s troubling them, whatever comes up. This is being done together by the Mayor and the Roselle Police Benevolent Association, the PBA that represents the local cops. Mayor Holley told me about his grandmother, a juvenile corrections officer for both county and state and past president of the National Black Police Association, and how as a kid he had early relationships and a personal connection to many police officers. He clearly wants to make that opportunity available to his residents. The Dunkin Donuts is just 4 blocks away from the High School, and with school starting at 8:15am, he hopes young people drift in to say hello. And the early morning timing works for most people’s work schedules, too – a drop in before the commute. Holley’s got these scheduled for the 3rd Monday morning from Sept. 15th through the end of the year. And I get the sense he intends a nice casual atmosphere of hellos and chat, something easygoing to bridge any gaps between residents and officers. Find common ground, open up lines of communication. And there’s room for these Monday morning’s to grow, with ideas the community may bring through the door. The N.J. Supreme Court (soon to be the Christie Court? ): has opened its 2013-14 session during which it might pass down important decisions on school education, marriage equality, affordable housing, gun laws and more. In the meantime Gov. Christie is in the midst of attempting to re-make the court in his image. He has already refused tenure for no good reason (other than he wants someone else) to both Democratic Justice John Wallace and Republican Justice Helen Hoens. Next year he may deny tenure to Chief Justice Stuart Rabner – another Democrat. With the departure of Justice Hoehns in October there will be three vacancies on the count, which the Chief Justice can continue to fill with temporary appellate judges. There are also three judges in waiting – nominated by the Governor but not currently under consideration by the Senate because their appointment removes balance from the Court membership. Having already successfully appointed one Republican (Justice Anne Patterson), he has an opportunity now to appoint three or four more (to create the Christie Court) unless Senate Democrats prevent it. 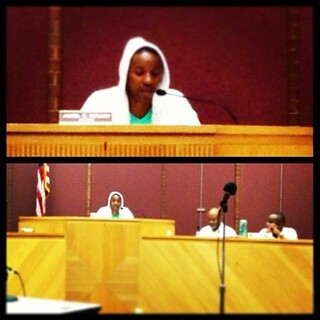 Vacancies on the court are not desirable but are acceptable. Allowing one man and one party to dominate the court is unacceptable. Medical Marijuana for kids: After the Assembly voted yesterday 70 to 1, the bill is expected to be signed today by the governor. He had conditionally vetoed the earlier bill and imposed restrictions which the legislature accepted in order to gain the bill’s passage. New Jersey League of Conservation Voters (NJLCV) releases its 2013 Environmental Scorecard: “NJ Legislature’s environmental record is slipping.” See the full report and how individual Senators and Assemlypersons scored. Buono/Silva gubernatorial campaign: 12:00pm, Barbara Buono: Environment New Jersey Press Conference, (on power plants and putting NJ back into the Regional Greenhouse Gas Initiative), 588 Duncan Ave., Jersey City. Barbara Buono, Assemblywoman Bonnie Watson Coleman, Assemblyman Benjie Wimberly and some 17 mayors, and councilpersons: 2:00pm, Press Conference with Urban Leaders, City Hall Steps, 1 Civic Square, Irvington. Christie/Guadagno gubernatorial campaign: Our absentee Gov. Christie returns to NJ: 11:30am, Riletta Twyne Cream Family School, Camden with Camden Mayor Dana Redd and Schools Superintendent Paymon Rouhanifard; 4:00pm, campaign announcement, Point Pleasant Borough Fire Co. #2. U. S. Senate candidate Cory Booker, news conference with Sierra Club state director Jeff Tittel, Hoboken’s Pier A. By the way, Holley’s an interesting person to follow on Twitter: @jamelholley.